It seems that I can’t get through one full week without trying a new brownie combination. Just wait until you see the next one I am going to experiment with. . . These are super simple. I used my go-to brownie recipe, and just added a few Oreos. You could even do the same with boxed brownies. Just make the frosting and add some more cookies. I only frosted a few because I just don’t love frosting on brownies. Mr. How Sweet really enjoyed the frosted ones. If you waste a good 3/4 of your day on Twitter like I do, you will know that last night Mr. How Sweet brought me home a dozen hot pink roses. I didn’t make him dinner, my half-unpacked mess is strewn in 4 different rooms, and I was in holey sweat pants once he got home. Oh yes, and I was half asleep while he professed his undying love to me. And I just continued to lay there. Sounds eerily similar to the night he proposed. Good thing there were brownies on the counter. As my dad says, marriage is rarely 50/50. The cookies somewhat melted into the batter once baked, but if you look closely you can see some cookies inside the brownies. That is the best part. The frosting is the same frosting I used for the cookies and cream cupcakes. It is creamy, delicious, and looks like ice cream. Can’t beat that. I think out of all the brownies I have made in the past few months, these ones may be the best. I love the texture. Chewy, gooey brownies + crunchy cookies. Melt butter and baking sqaures in a microwave safe bowl. In the mixing bowl, cream melted butter and chocolate mixture. Add in sugar and vanilla and beat until fluffy, about 2-3 minutes. Add in eggs, beating one at a time. Add flour and stir just until combined. Fold in cookie crumbles. Pour into greased 9 x 13 baking dish (I used a 8 x 8 square cake pan). Bake for 35-45 minutes, or until just barely done. Cool before frosting. *I changed this recipe slightly from my other brownie posts, so if you have recently tried it, try adding 2 more eggs! I don’t think these brownies will last another evening in our house. Ha, who am I kidding? They may not even last until Mr. How Sweet gets home. Now, I need to find some spectacular recipe to make for dinner tonight. And remind Mr. How Sweet that he married someone 10 years younger, not an old granny. Crispy Cauliflower with Hot Parmesan Dip. Thanks for your sweet comment the other day, Jess! If I gain more weight after making these babies, I’m comin’ after you! They look amazing!!!!!! I love how moist your brownies/ cakes always look … how do you know if they are “just barely done?” … because that is how I like them. Of course these are the best!! 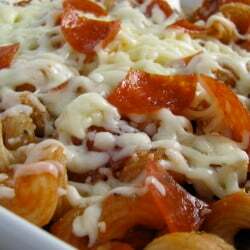 I was salivating after the first picture…then after reading the recipe and seeing more pictures I am craving these!!!!! 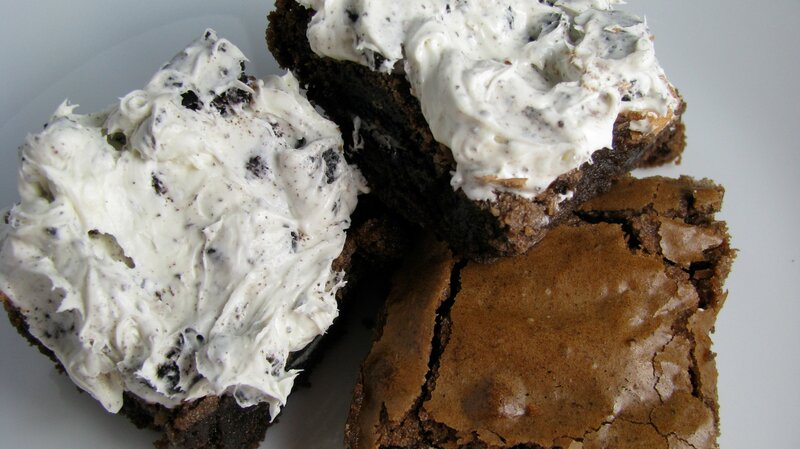 What a fun brownie recipe – I love the addition of oreos. I love the sweatpants even more. I love homemade brownies a little too much. That’s why I make them like once a year. Growing up I didn’t even know that people ate brownies without frosting. Oh roses…hot pink, nice work Mr. How Sweet! Chewy, gooey & crunchy…you’ve got my attention! These look so delicious. On my to do list for sure! Ooooh yum! 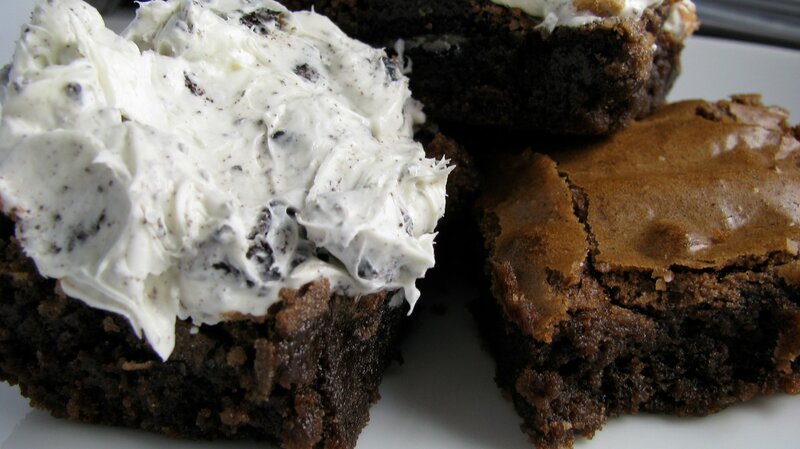 Love the idea to add oreos to your brownies. You’re just brilliant. They wouldn’t last more than a day in my house, either. umm yeah, you’re definitely bringing these when we have you over for dinner, haha! I have to make these. With frosting. Tonight. YUM! OK…so you made the recipe as printed but used an 8×8? No measurement changes? that looks delicious…can i ask, for religious reasons i can not use vanilla extract (b/c of the alcohol), could you tell me what i could substitute for that? You can use vanilla bean pasta or vanilla beans from the pods. Or just skip it – you won’t really notice a huge difference. Quick question…does this recipe call for a total of 6 eggs ( with the suggestion of adding two more eggs ) or is it still a total of 4 eggs? Thanks! Just made these and they tasted amazing, only problem was that mine came out looking really lighter (light brown) not dark like the pics. Other than color everything was great, but I didn’t have any butter to make the frosting… Too lazy to go to the store, maybe today I will eat just the frosting since the brownies have been pretty much devoured in minutes. Thanks for the great recipe and I used the alcohol free trader joes vanilla. How many ounces or grams is a square of baking chocolate? I’m from Europe and I have no idea how many baking chocolate I need to have on hands here. According to Mr. Google 2 squares equals 2 ounces? Is that correct? I made this today for my husband to take into his fellow law students and they were a huge hit! Supposedly they were gone in like four minutes! No joke. I actually make a lot of your stuff for them and they always rave about it. Thanks for the amazing recipes! Just wanted to clarify…..is this the ooey gooey recipe with oreos instead of marshmallows? ooey gooey calls for 1/2 cup of butter and this one says 1/2 lb. thanks for the help! hi, i had the same question that Lindy “How many ounces or grams is a square of baking chocolate? I have no idea how many baking chocolate I need to have on hands here. According to Mr. Google 2 squares equals 2 ounces? Is that correct?” :( I´m from Venezuela. just to be sure, 2 LBS of powdered sugar? that much?? ?, im not sure what lbs means in english, but in spanish lbs is short for libras, which is a pounds. So, 2 pounds of powdered sugar for the icing alone?? I’ve tried this recipe twice and messed it up both times :( Yours look amazing!